In reality, pet snakes never actually attack their owners - or, at least, it’s very rare for them to do so. You’re more likely to be bitten by your friendly pet dog than a pet snake. This is the most common reason. 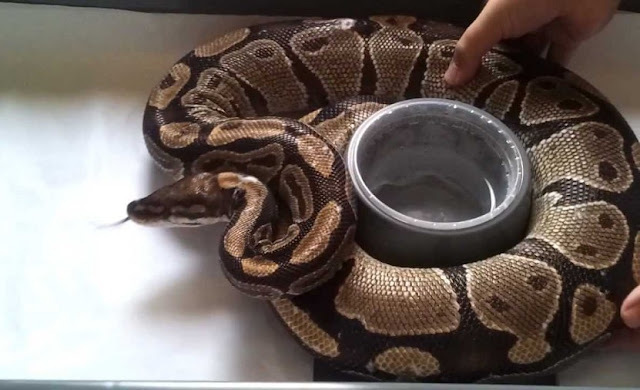 The owner tries to hand-feed the snake a frozen/thawed rodent, and the snake misses and hits their hand instead. Or the owner has been handling their food, and didn’t remember to wash their hands first. The smell of the food is in the air, and the owner reaches into the snake’s enclosure without caution. Expecting food, the snake strikes by mistake. This is ALWAYS the owner’s fault. Snakes have very powerful instincts regarding how they handle their food - for example, a constrictor will wrap its prey in its coils and squeeze until the prey stops moving. It won’t let go until movement stops, because doing so could result in serious injury to the snake. Snakes can’t really overcome this instinct. So the owner has to wait until the pet boa or python hopefully lets go. The snake is usually somewhat sheepish after these incidents, and snakes with a more shy temperament will often refuse to eat right after it has happened. They don’t want to eat or harm their owner - it was only a mistake. Many species of snakes, particularly constrictors, have poor eyesight - so they rely on heat sensing and smell to tell what is what, and who’s who. The snake has been startled or is actually frightened, and wants to be left alone. A quick bite and release gets the point across. This occurs when someone startles a snake by reaching for it when it wasn’t paying attention, or grabbing it suddenly. Especially with snakes that aren’t tame or simply don’t like being handled. Very young snakes are often defensive too, because they haven’t yet learned that humans mean no harm. This is the least common cause of bites from pet snakes. It’s hard to say whether it’s an ‘attack’ or not. Probably not. No one really knows what the snake is thinking in these cases. It’s very rare, but sometimes a snake will simply bite a person for reasons unknown. One ball-python owner was once holding their snake, when it bit him in the armpit. Who knows, maybe it was warm and smelled funny, so he decided to see if it was food? #lol. Sometimes a snake will just deliberately clamp its jaws on an exposed arm, then let go. Perhaps it just isn’t happy being held anymore, and wants to go back in its enclosure, but we really don’t know what they are thinking. The vast, vast majority of snakes never do this - and the ones that do, may do it only once in a lifetime. It’s rare enough to ignore, but it does happen, so I included it. Snake teeth are backward-curved, sharp as needles, and in most species, pretty short. As a result, they will leave a neat u-shaped row of pinpricks, which tend to bleed freely, but almost painlessly. Non-envenomated snake bites from all but the largest pet snakes really don’t hurt, and tend to heal cleanly. A scratch from a pet kitten is MUCH more painful, and poses a greater risk of infection, too. Just as nearly every cat owner has been bitten or scratched a few times by their pet cat, so every snake owner has been bitten once or twice - it’s no big deal. Just part of the cons of pet ownership. But a tame pet snake is reasonably trustworthy, and is very unlikely to just decide to bite out of the blue. There’s virtually always a reason, and it is pretty much always the owner’s fault. Donna Fernstrom is a reptile breeder and keeper.